I was motivated to give beef ribs a go on the kamado yesterday. Seasoned with salt, pepper, garlic, and home smoked paprika. Smoked with beech and cherry at approximately 260F until probe tender (about 6 hours). Here are a few pics of the cook. 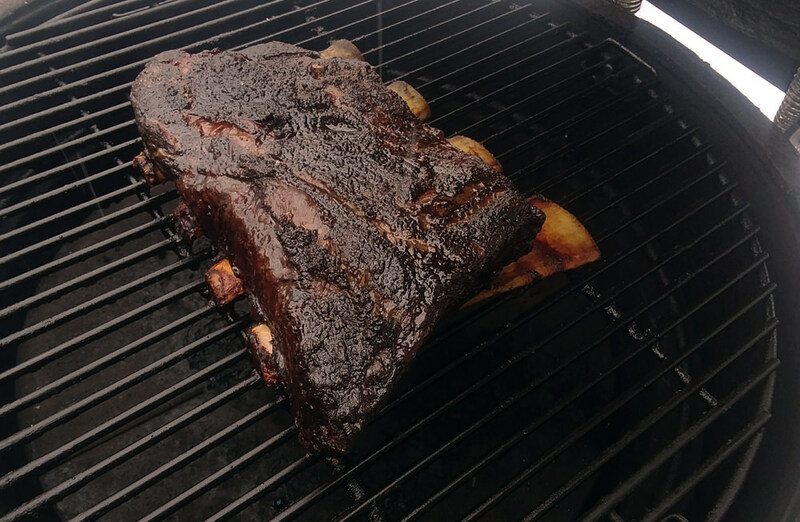 (02-05-2018, 05:20 AM)PanChango Wrote: I was motivated to give beef ribs a go on the kamado yesterday. That makes me hungry !!! Did you foil at any point? I love the flavor of short ribs, but there is too much connective tissue and fat (the bad fat, not the melt in your mouth fat) for my taste. Yours look magnificent BTW. (02-05-2018, 07:50 AM)22bulldog Wrote: Did you foil at any point? Not on the grill. After they came off the grill, I wrapped them in foil and a towel to hold while I did the sides. They rested for about 45 minutes. Dale, you have me salivating. I LOVE shortribs. They're probably my favorite part of the beef critter. (02-05-2018, 09:56 AM)ShadowsDad Wrote: Dale, you have me salivating. I LOVE shortribs. They're probably my favorite part of the beef critter. This may have been the first time I made them, but it will not be the last.